The Bookmarked series focuses on a famous work of literature that left a powerful impression on an author (hence the name, Bookmarked--a book that left its mark). Each entry in the series will be a no-holds-barred personal narrative detailing how a particular novel influenced an author on their journey to becoming a writer, as well as the myriad directions where that journey has taken them. 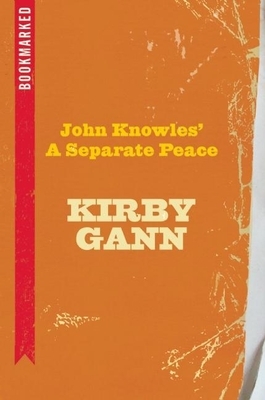 In the first book in the series, critically acclaimed author and series editor Kirby Gann takes on John Knowles' classic about the tragic friendship between two boys at a boarding school. Kirby Gann is the author of the novels Ghosting, Our Napoleon in Rags and The Barbarian Parade. He is the recipient of an Individual Artist Fellowship and two Professional Assistance Awards from the Kentucky Arts Council. Gann is managing editor at Sarabande Books, and teaches in the brief-residency MFA in writing program at Spalding University.